This entry was posted in Vacuum Tubes and tagged 12ax7/ECC83, Psvane by tubemaze. Bookmark the permalink. I was very intrigued by information about Psvane 12ax7 tubes and decided to give them a go. I tried their 300B, KT88 and 12au7, 12at7 – some where nice, some where just mediocre. I got myself a set! I’m not sure what they used to test the tubes, but I had them tested on 3 tube testers and one was within specified test results, which were 1.9 GM, BTW. The other tube didn’t do so well, instead of specified 1.9 GM, it tested on one side 1.2 and 0.6 GM on the other side!!! 2 of my amplifiers decided to reject the second tube all together. Couldn’t amplify with such a low GM, so there they went to a tester – and gain showed 10, I started to look where the other 90 points went. One of the issues with some new production tubes is that materials that are used in a tube are not clean and that could cause the tubes to show low results. OK. 24 hours in a tube warmer (it’s a device to burn in tubes :). The tube came to life, but now I had a big question, if the material were contaminated, how did they do testing??? And why would this contamination happen on PREMIUM tubes??? Not cool. Another thing that I’ve noticed is that compared to NOS tubes or even new production Genalex tubes, this one has very thin pins. They are gold and all, but thin – could created problems in some system. After it all settled down, I retested the tubes and as expected, the tubes were no longer matched – 1.9/1.9 for one tube and 2.3/1.9 for the other tube 🙁 I mean, I don’t really care if the tubes are matched, but they have been sold as matched. Then 24 hours later (more burning in – and now at 48 hours), I tried the tubes in my multiple amplifiers. From pure SE Triode to SE Ultra-Linear and then P&P Pentode. All had different plate voltage and even biasing schemes. And the results, no miracle here. the tube is not a NOS killer – far from it. The tubes has pluses – great bass, large sound stage, very transparent (but without smoothness like Telefunken), dynamic. But then the body of the sound very flat – it took me back to solid state days 🙁 There is not texture to vocals and instruments (details is not texture, Ladies and Gentlemen), no nuances. And the sound is not smooth, quite sharp – very tiring. So all in all, this is not a bad tube, good step forward, but still a lot of work ahead before I can say with clear consciences that this tube is great. I will give these tubes more burn in time and will report if anything will change – I don’t keep my hopes up. You are 100% accurate in your evaluation of the Psvane 12AX7T. It is very un-involving, very flat and SO DRY; the Psvane does not resolve subtle ambience cues in fine recordings and completely fails to deliver the EMOTION content of music. The Psvane sound never “moved me” in any way. It really has that “transistor in a glass bottle” sound… the Psvane 12AX7Ts made both my modified EAR 834P MM/MC phono-stage and my vintage Audio Research SP8 MK II sound flat, dull, lifeless…. like an Adcom GFA 535! Except because I needed TWO PAIR of Psvane 12AX7T for the Audio Research, I spent more on these Psvane 12AX7 tubes than an Adcom preamp would ever cost on the used market. I heard NO improvement over the basic China-produced $25/PAIR Shuguang 12AX7B when compared to these $80/Pair Psvanes! The real issue for me is that strong-to-NOS testing vintage Telefunken ECC83 tubes with smudged logos or Fisher and Dynaco logos , can be purchased for around $45 each on eBay, and they are superior in EVERY WAY to the Psvane. 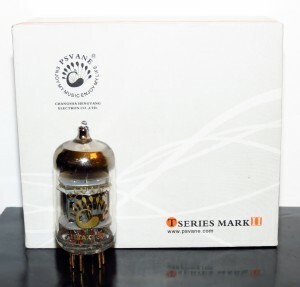 (BTW: Smart Shoppers– look for Telefunken/Mullard?Amperex/RCA tubes with a smudged logo but is still a great tube! One cannot listen to a LOGO.. or a tube box for that matter so one should not get too obsessive about logos and boxes!) An Ei ECC83 is another great NOS alternative. If you desire a better modern 12AX7 tube, I can personally recommend the Tianjin Full Music 12AX7. They really are great in my gear; they look quite similar to the legendary Mullard M8137/CV4004. These tubes are about the same price as the Psvane 12AX7T, but are really quite good, with excellent 3-D soundstaging and decent low level detail resolution. The Tianjins seem especially well-suited for phono-stage use. Another alternative is the Shuguang 7025. These are only about $14.50 on eBay when sold as “Shuguang 7025” and are absolutely a different tube from the Shuguang 12AX7B. If you need selected, low noise tubes, the Shuguang 7025 is sold by Tube Amp Doctor and also by the Tube Store in premium selected form; the Tube Store sells them as their “Preferred Series 7025” for around $25… for that price they are screened for low noise and low microphonics; for $5 more, they will sell one with low noise AND balanced sections. Tube Amp Doctor marks this tube up considerably more– they want around $40 for the EXACT same tube. This 7025 tube is an improved version of the “Mullard ECC83 Copy” made in China and sold by Groove Tube a few years ago. The new version has great sound AND great reliability. Either the Tianjin ECC83 or any of the China 7025 tubes is preferable to the Psvane… and the Tube Store “Preferred Series 7025” is a GREAT tube for only $25; I prefer it by far to the modern New Sensor Mullard re-issue 12AX7 by a huge margin and even favor it over the expensive Gold Lion 12AX7 reissue tubes in certain applications. Yes– it’s THAT GOOD! As always opinions of tubes differ. I have been quite happy with the Psvane 12AT& tubes as preamp tubes in my Decware Mini Torii. They do require a long time to settle in. I’ll have to try the Shuguang 7025 and perhaps the TJ 12AX7. FWIW I never cared for Telefunkens. I have a pair of the Shuguang Nature or Natural series 12AX7’s and they are fine in my single ended TRK3488 amp. Are these better than the best, to my ear in my gear, old production? No, but so many variations of those tubes were produced and there are some duds there too. It is still good for all of that we have some decent new production tubes available. I have a pair of Psvane in a Rogue Pharoah with 105 hours on them now, they have a very full lower midrange/bass and aren’t very articulate in this region. You mention they require a long time to settle in, how long did you find this period to be and does for lack of a better term midrange bloat disappear?